The highest quality hose kits on the market, backed by a lifetime warranty. 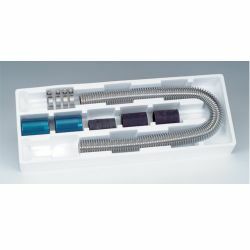 Kits include a 2 feet or 3 feet length of copper chromed corrugated tubing, two rubber connectors with reducer sleeves, two covers (when applicable), four stainless steel clamps, and one tube of gel glue. 3 feet kits may be modified to work with both upper and lower hoses with the purchase of additional ends and covers.